My name is Sunisa but everyone likes to call me Taan and I'm 28 years old. I have one younger brother, one younger sister. They are 27 and 12 years old. 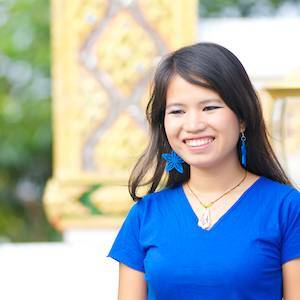 I study at Ramkhamhaeng University in Bangkok and also work with the Outreach Teams Department here at YWAM Thailand. Currently, I am a translator helping teams with language so that they can bless and serve Thai people. I believe the Thai people need to hear the good news about God, so that is why I am serving as a translator for the teams. How did I come to know GOD? I remember seeing the life of a friend of mine in high school who knew God and I thought her life was very different from mine. Then, when I started university, I met a team who came to work with BJD. They were inviting students to come and learn English. So, I decided to go and learn English and also to hang out with the team and the rest of the students at BJD. I learned so much about the Christian faith and decided to move to BJD to learn even more. After 3 years of living at BJD and learning about God, I felt He was calling me to do my DTS in Chiang Rai. I really wanted to go deeper in my walk with Him. After I finished my DTS I felt GOD challenge me to join the Outreach Teams Department. Even though it is challenging, I also enjoy it very much. I love the fact that I get to bless and serve the teams that come but also get to help Thai people know more about God. If you would like to know more of what I am doing, please don't hesitate to contact me.